Style: Wheat ale brewed with lemon peel & grains of paradise. Appearance: Dark copper with a light foamy head. Slighly cloudy. Nose: Malt, mandarin orange, peach. Palate: Medium bodied and effervescent. Lightly roasted malt, hint of yeast, balanced by some acidity. Finish: Fruit then a bit hit of bitterness. Lingers for a long time with a bit of stickiness on the lips. Parting words: This Atwater’s take on the summer wheat ales that Michigan brewers have made popular (we can all name at least one). This one is different than its cousins, though, because of its bitterness and much more subtle fruit flavors. If I hadn’t read the label, I would never have known that lemon peel was used in the brewing of this beer. That’s not a knock, though. Some of these types of beers can be too fruity and ham-fisted in their use of fruit and spice. If anything this is a little too far on the other side of the spectrum. There’s a little too much bitterness and richness for a summer ale. Seems more fitting for fall. Still, it’s enjoyable and the price is typical for microbrews. 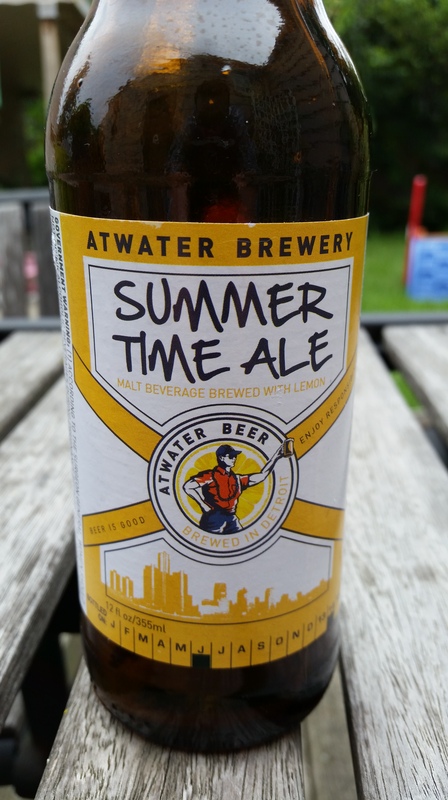 Atwater’s Summer Time Ale is recommended.